It’s 6 pm and the sun is setting over Santorini. Crowds of sunset-worshippers are drawn out of the warren of shops and bars to congregate along the main terrace in Fira. It’s a daily ritual for the tourists here that verges on religion. Cameras and smartphones turn towards the horizon and a hush descends on the crowd. I take a left turn and follow some narrow streets away from the hordes. Everyone is so busy watching (and snapping) the sun disappear that, personally, I think they are missing a trick. The real spectacle is the way the whitewashed streets turn a honey gold in the light. 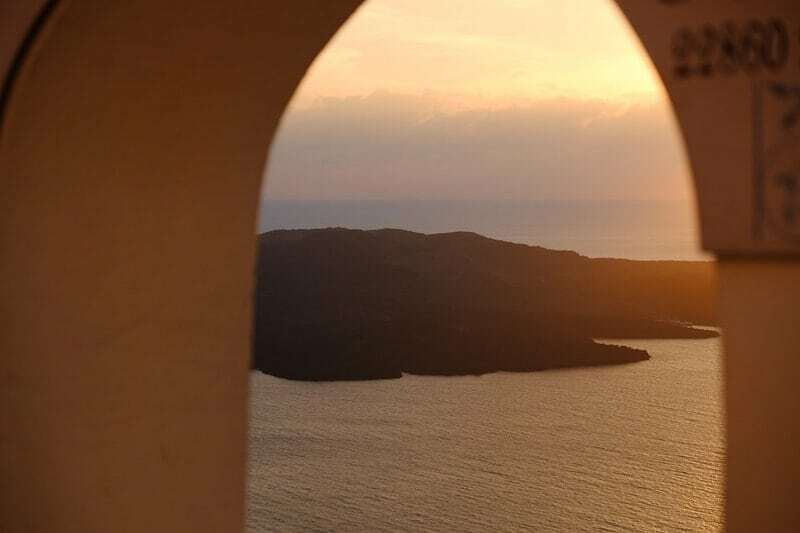 Santorini is not the only Greek island sporting tumbledown Cycladic houses but here they are perfectly situated for sunset. The caldera (from the Greek word for ‘cauldron’) villages are built along the rim of a volcanic crater. It’s a west-facing croissant-shaped balcony. 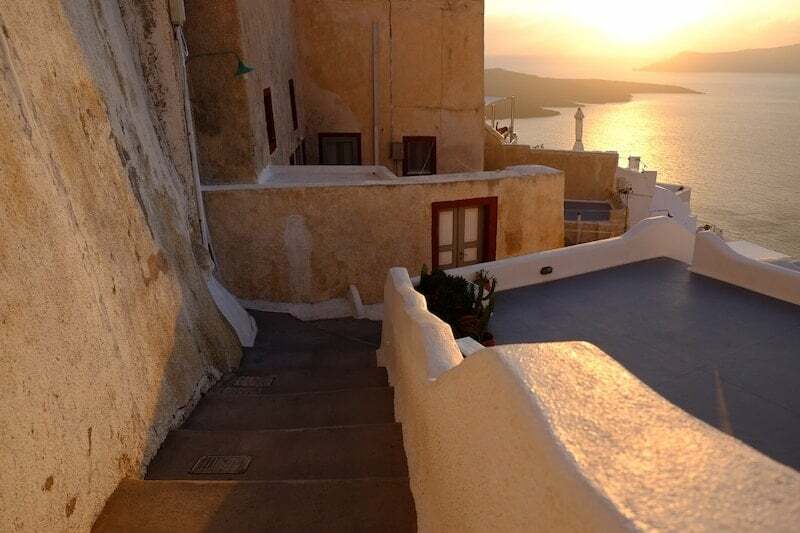 When watching the sun go down in Santorini, don’t forget to look behind you. The next night I make the pilgrimage to Oia for the sunset. I’m not the only one with this idea: hotels across the island, as well as the cruise ships, run buses to Oia for the sunset. 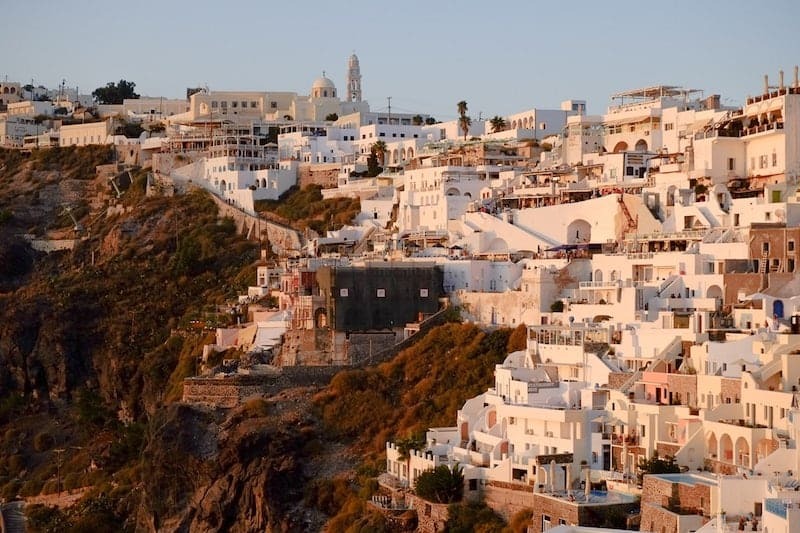 Oia is arguably the most picturesque of the caldera villages and markets itself to an exclusive crowd. Visit during the day and it’s surprisingly quiet; the difference is dramatic. The Venetian castle makes a perfect vantage point for the evening busloads. The village swells, and I suffer several elbows to the ribs as people jostle for position. It’s mid-October and the end of the season, not that you’d know by the crowds and the sunshine. I can’t even imagine how busy (and hot) it is in high season. 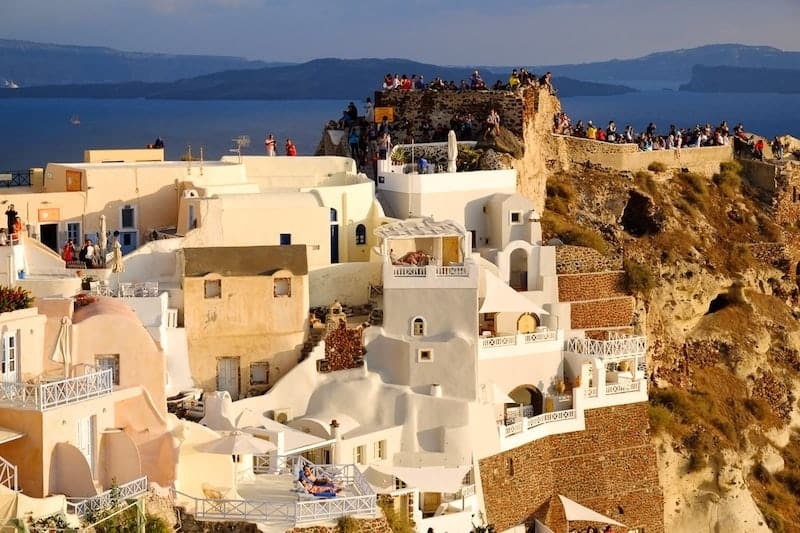 Santorini is one of the top tourist draws in the Mediterranean: last year more than 2 million people visited Santorini. In 2016 island started capping cruise ship numbers. In fact, the only place that felt quiet was my accommodation—the unique Cavelands hostel, in a converted 18th-century winery in Karterados. Perhaps the 30-minute walk to Fira. Tourism has exploded here since the airport was built in the 1990s, and is now battling the familiar issues of overtourism—insane property prices and living costs, infrastructure that can’t cope with the numbers, conservation issues. I duck away quickly once the sun has gone down, and—expecting the restaurants to be similarly crowded for dinner—quickly bag a table in a cobblestone courtyard draped in bougainvillaea. But the crowd seems to retreat en masse to its hotel/ship for dinner, so I have the restaurant mostly to myself. 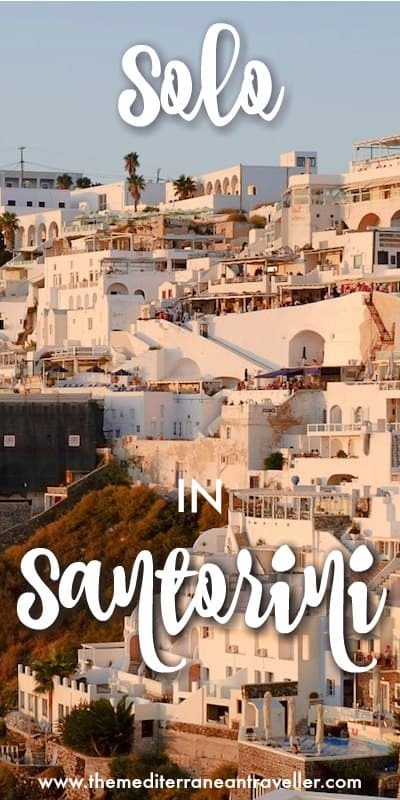 Santorini is a famously romantic destination for couples, and Oia is its heart centre. It’s absurdly romantic. The streets reverberate with the hum of cheesy ballads and soft saxophone. At night the whole village must be lit by candlelight. Menus are divided into set menus with prices that vary according to your commitment levels. Curiously, the lowest rung is the ‘acquaintance’ menu. I wholeheartedly embrace this concept and dine out nightly on acquaintance menus with new friends from the hostel, taking turns photographing each other against the sunset. It seems like the right thing to do. You will never see so people taking photos of each other. There are couples having pre-wedding photoshoots, wedding photoshoots, honeymoon-photoshoots. Around every corner is a blogger/influencer adorning a white wall in a floaty dress and floppy hat, dutiful Instagram husband in tow. Gaggles of cruise-shippers with selfie-sticks. People come to Santorini for the sunsets, the romance, and the photo ops. But I had actually come to Santorini for the wine (ok, ok, also for the photo ops). The island’s white variety Assyrtiko is one of the most important and well-known of Greek wines. And dry volcanic white wines happen to be my favourite. There are scores of wineries on the island and organised tours are readily available. Unfortunately, my plans were scuppered by a cold which rendered my taste buds useless. There’s no point shelling out for tours and tastings if you can’t taste anything (I later make up for this in Athens where I drink all the Assyrtiko I can find). Being mid-October, it was already winter back in England. I drank in the sunshine whilst I could. Santorini can be an apocalypse on your senses. The harsh volcanic landscape is intensified by the saltiness of the food, blinding sun, and the inky blue of the sea. And damn it’s windy – nobody warns you, but the caldera villages are pretty high up. The only softness here is in the light—but oh what light—and the curves of the buildings. I watch the sun go down from a multitude of locations whilst on Santorini. But, ironically, the best sunset I see is several days later, having left Santorini for the neighbouring island of Naxos. I’ll be back one day for the vineyards though.